What does it take to be a historic building? According to regulations governing the National Register of Historic Places, the first requirement is a minimum age of fifty years. By that standard, the South Wind Motel on this postcard now qualifies. Although many names have been used to convey the idea of a car oriented hotel – motor courts, motor lodge, and motor inn among them – the most enduring title is “motel.” This word, blending “motor” with “hotel,” was coined by a California architect in 1925, for a tourist hotel in San Luis Obispo. In the early years, such roadside lodging typically consisted of small individual buildings spaced around a central area where cars could park next to their sleeping owners. By the early 1940s, these freestanding cottages gave way to continuous, one-story buildings, sometimes L- or U-shaped, with regularly spaced windows and doors. A paved and partly landscaped courtyard was a distinguishing feature as well. After World War II, autos became more affordable and increasing numbers of families took to the road. Businesses sprung up to accommodate this newly mobile society, business that no longer felt the need to be downtown. Since Rock Island’s 11th Street was also US Route 67, a major north-south highway, it was a prime location for auto friendly business. Over a short time, the character of the street changed from mostly residential and even agricultural to business — retail, auto sales and service, restaurants, and lodging. 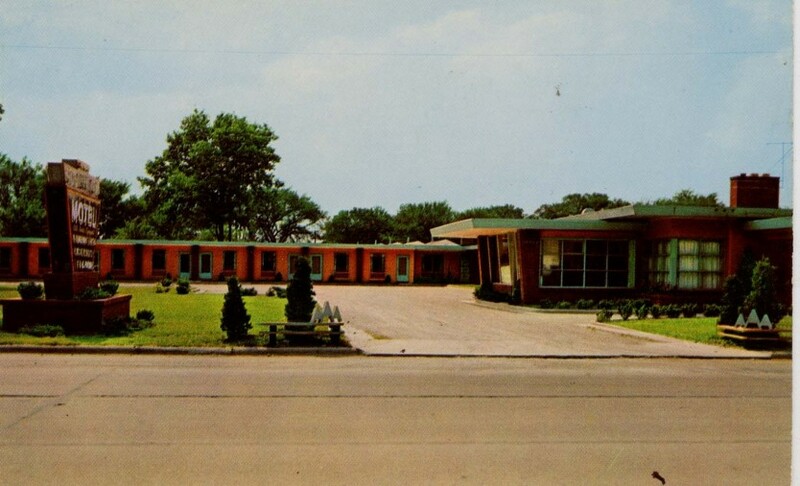 Although a camping facility had been located several blocks south where 9th and 11th Streets merge since the 1920s, the South Wind Motel, which opened in 1953 at 4300 11th Street, was the first lodging house in Rock Island to call itself a motel. The low, flat-roofed building on our 1950s postcard, from the Special Collections of the Augustana College Library, is immediately identifiable as a motel because of the multiple doorways. It is not so obvious that this motel was built in a U-shape although a driveway can be seen leading to the interior grounds. The motel office on the far right is much more stylish than the ribbon of sleeping rooms. As in the rooms, there is a flat roof, but here it is on staggered levels, adding architectural interest. A wide cantilevered roof extends over the driveway, partly supported by trapezoidal-shaped supports. Windows comprise most of the walls, even meeting at the corner. The chimney is low and wide. By 1960, South Wind ads specify that singles, suites, and doubles are available, and even that credit cards are accepted. (How many of us were using credit cards in 1960?) Sometime in the early 1960s, the cantilevered roof on our postcard was extended over an addition that was constructed within the former courtyard area. It contained a restaurant, bar, and adjacent swimming pool with an underwater window overlooking the basement bar. Many residents remember the real-life mermaids performing gracefully behind the thick glass. After Mr. Doak retired to Florida in 1966, the motel came under new ownership. After another owner took over in 1980, the motel received its current name – the American Motor Inn. The swimming pool is gone, but little else has changed on the exterior. Even today, the former South Wind evokes the 1950s. This article, by Diane Oestreich, is slightly modified from the original, which appeared in the Rock Island Argus and Moline Dispatch on January 4, 2004.